Stand up and be counted! 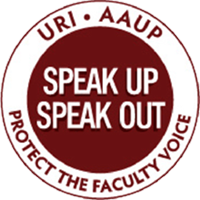 By joining the faculty members of the URI AAUP you count yourself among the dedicated professionals here at URI who help to shape the future of their profession and proclaim their dedication to the education community. Joining the AAUP says that you're concerned about academic freedom, and about the way that basic freedom protects your teaching and research. It says that participating in faculty governance is important to you, and that you are concerned about career issues and tenure. As a full-time faculty member you give a lot to our students and to the University. By joining the union you take a big step in protecting your rights. In addition, there are many practical benefits--discounts, insurance programs, financial incentives--available to AAUP members. Join your colleagues today to promote and protect your profession. Please note: the National AAUP should now be directing all membership applications to the local union. By joining the local, you are automatically a member of the national union.